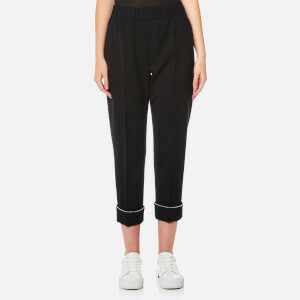 Wool pinstripe trousers from MM6 Maison Margiela. 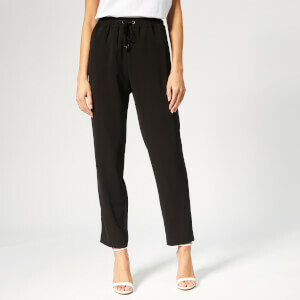 Woven from a felt wool blend with subtle stripe design, the tailored pants feature a traditional button and zip fly fastening with belt loops and an elasticated panel to the rear for a contemporary touch. 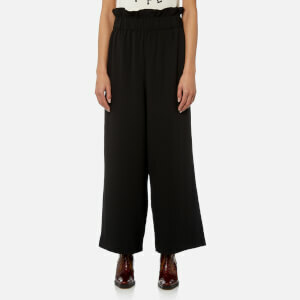 Cut for a high-waisted, cropped fit with central stitched pleats and detailed with side slip pockets. Finished with rear welt pocket and the label’s signature contrast embroidered motif.